After the American Revolution ended, a Philadelphia financier in 1784 sent the ship Empress of China for the first voyage of direct trade between the United States and China. In the 60 years following the Empress of China’s voyage, relations among U.S. citizens and Chinese were private and largely commercial. Nevertheless, Sino-American trade grew under the Chinese system that limited foreign traders’ access to a single port city, Guangzhou (Canton). Formal recognition by the United States of the Empire of China, and by the Empire of China of the United States, came on or about June 16, 1844, when U.S. Envoy Extraordinary and Minister Plenipotentiary Caleb Cushing presented his credentials and met with Chinese official Qiying to discuss treaty negotiations. Prior to this, the United States had dispatched consuls to Guangzhou as early as 1784—the first was Samuel Shaw, the supercargo on the Empress of China—but these had never been formally received by Chinese officials as state representatives. The two countries had acknowledged each other’s existence before 1844, but the negotiations and treaty of that year marked the first recognition under international law. 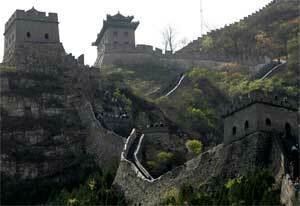 Section of the Great Wall in Beijing, China. Establishment of Consular Relations, 1844. Beginning with Samuel Shaw in 1784, the United States appointed a number of consuls to serve the interests of U.S. merchants in Guangzhou. The appointees were themselves usually merchants. However, these consuls served intermittently and without instructions from Washington, and never received formal acknowledgment of their limited consular credentials from the Chinese Government until after 1843. Thus the start of official consular relations dates to the appointment of a U.S. consul to the ports of Fuzhou (Foochow) and Xiamen (Amoy) in 1844. Establishment of Consular Posts, 1844-1947. Fuzhou (Foochow) 1844; Shanghai 1847; Macao 1847; Xiamen (Amoy) 1849; Ningbo (Ningpo) 1853; Whampoa 1853; Guangzhou (Canton) 1853; Shantou (Swatow) 1860; Beijing (Peking) 1861; Niuzhuang (Newchwang) 1862; Yantai (Chefoo) 1863; Hankou (Hankow) 1863; Zhenjiang (Chinkiang) 1864; Jiujiang (Kiukiang) 1867; Tianjin (Tientsin) 1871; Chongqing (Chungking) 1896; Dalian (Dairen) 1904; Hangzhou (Hangchow) 1904; Nanjing (Nanking) 1904; Shenyang (Mukden) 1904; Qingdao (Tsingtao) 1906; Harbin 1907; Andong (Antung) 1914; Changsha 1915; Jinan (Tsinanfu) 1918; Kunming (Yunnanfu) 1921; Guilin (Kweilin) 1943; Chengdu (Chengtu) 1945; Changchun 1947. The United States established a consular post in the British colony of Hong Kong in 1843. The United States also established consular posts in Taiwan during the time that it was a colony of the Empire of Japan, in Danshui (then called Tansui or Tamshui) in 1898 and in Taipei (then called Taihoku) in 1914. The above dates reflect, as accurately as possible, the date when a full consul (as opposed to vice consul or consular agent) was either first assigned to or arrived at each post. Establishment of Diplomatic Relations, 1844. Diplomatic relations were first established on or about June 16, 1844, when Caleb Cushing presented his credentials as Envoy Extraordinary and Minister Plenipotentiary and Commissioner to the Chinese authorities in Macao. He concluded the Treaty of Wangxia (Wang-hsia) on July 3, 1844, after which the United States maintained diplomatic representation in China at Guangzhou. Legation Moved to Beijing (Peking), 1862. The U.S. Legation was established in Beijing (Peking) in 1862. This followed the Treaties of Tianjin of 1858, by which agreements China for the first time allowed Western diplomats to reside in the capital city, Beijing. Diplomatic relations were interrupted on February 12, 1912, when, as a result of the Chinese Revolution, the Manchu Emperor abdicated his throne in favor of a provisional republican government. The United States withheld recognition of this new provisional government while awaiting the organization of a permanent government. Diplomatic relations were resumed on May 2, 1913, when the Legation in Beijing communicated a message from President Woodrow Wilson to President Yuan Shikai of China upon the convening of the National Assembly for the new Republic of China. Diplomatic relations were interrupted on December 9, 1924, when the Legation in Beijing informed the newly declared Provisional Government of the Republic of China that the United States would maintain “de facto relations” with it, pending the establishment of a formal government. On July 25, 1928, following a period of governmental instability and the emergence of the Nationalist Government of the Republic of China, U.S. diplomatic representatives in China signed a tariff revision treaty with Nationalist officials. The Department of State declared that this act constituted full recognition of the Nationalist Government of China, with which diplomatic relations would be conducted. Establishment of Subordinate Diplomatic Mission at Nanjing (Nanking), 1928. The Nationalist Government established its capital in Nanjing (Nanking), in 1928; however, the United States kept its Legation in Peking and set up “sub-embassy” facilities in Nanjing to facilitate official diplomatic contact with the Nationalist government. The Department of State wanted the official U.S. diplomatic mission to remain in close proximity to the diplomatic representatives of other foreign powers in Peking. It also was skeptical of the Nanjing regime’s long-term viability. Legation Raised to Embassy, 1935. The Legation in Beijing was elevated to the level of Embassy on June 18, 1935. U.S. Diplomatic Representation during the Chinese-Japanese “undeclared war,” 1937–1941. Throughout the “undeclared war” between Japan and China (1937–1941), the United States maintained its official diplomatic mission in Beijing. The U.S. Ambassador, however, began in August 1936 to reside intermittently near the Chinese government in Nanjing. The Ambassador subsequently moved on November 27, 1937 to Hankou. On August 2, 1938, he went to Chongqing (Chungking), after the government of the Republic of China moved in response to Japan’s invasion and capture of Beijing and Nanjing. Embassy Moved to Chongqing, 1941. On or about December 8, 1941, the official U.S. Embassy was moved to Chongqing . The move followed the outbreak of war between Japan and the United States on December 7, 1941, and the Japanese capture of U.S. Embassy facilities in Peking. Embassy Moved to Nanjing, 1946. On or about May 1, 1946, the U.S. Embassy was moved to Nanjing after the government of the Republic of China had moved there following the defeat of Japan in World War II. Embassy Moved to Guangzhou, 1949. On August 5, 1949, the U.S. Embassy was moved to Guangzhou after the government of the Republic of China had moved there in response to advances by Chinese Communist forces during the Chinese Civil War. Embassy Moved to Chongqing, 1949. On October 18, 1949, the U.S. Embassy was moved to Chongqing , after the government of the Republic of China had moved there in response to advances by Chinese Communist forces during the Chinese Civil War. Embassy Moved to Taipei, Formosa (Taiwan), 1949. On December 19, 1949, the U.S. Embassy was moved to Taipei, Formosa (Taiwan), after the government of the Republic of China had moved there in response to advances by Chinese Communist forces on the mainland during the Chinese Civil War. The Chinese Communists established the People’s Republic of China (PRC) on the mainland on October 1, 1949; however, the United States refused to recognize or establish relations with the PRC. The United States continued to recognize the Republic of China government located on Formosa as the legitimate government of China and maintained diplomatic relations only with the Republic of China. Establishment of U.S. Liaison Office in Beijing, 1973. President Nixon visited the People’s Republic of China in 1972 and agreed to the joint “Shanghai Communiqué” of February 27, 1972, in which both nations pledged to work toward the full normalization of diplomatic relations. As part of the effort toward normalization, on May 1, 1973, the United States opened the U.S. Liaison Office in Beijing to handle all matters in the U.S.-PRC relationship “except the strictly formal diplomatic aspects of the relationship.” The People’s Republic of China created a counterpart PRC office in Washington, DC in the same year. Establishment of Diplomatic Relations with PRC/Termination of Diplomatic Relations with the Republic of China, 1979. On January 1, 1979, the United States recognized the PRC and established diplomatic relations with it as the sole legitimate government of China. On the same day, the United States withdrew its recognition of, and terminated diplomatic relations with, the Republic of China as the government of China. Closing of U.S. Embassy at Taipei, 1979. The U.S. embassy in Taipei was closed on February 28, 1979. Opening of U.S. Embassy at Beijing, 1979. The U.S. Liaison Office in Beijing was converted to an Embassy on March 1, 1979, and Leonard F. Woodcock, who had been head of the Liaison Office, was appointed Ambassador.